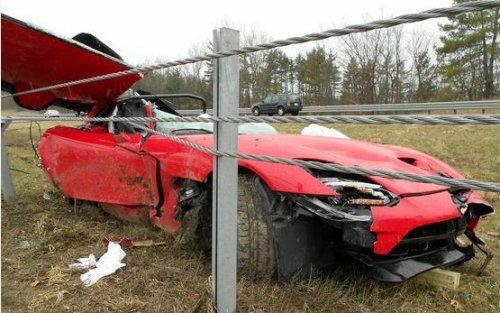 On April 15th, a bright red 013 SRT Viper was seen jammed through the median dividing cables that separate the northbound and southband lanes of US 23 in Hartland Michigan with substantial damage. The damage to the vehicle was so severe that the first responders were forced to use the “jaws of life” to cut away the roof to get to the injured driver. The driver of the wrecked 2013 SRT Viper was Martin Morse of Howell Michigan; a veteran member of the Chrysler Group engineering team. Sadly, the injuries sustained proved to be fatal as Mr. Morse died at the scene of the accident. At first, little was known about the accident shy of the fact that the destroyed Viper wore Michigan manufacturer’s license plates but as the Michigan State Police have spoken to witnesses, a better picture has been painted of what happened to result in the accident that killed the Chrysler engineer. According to the Michigan State Police, Mr. Morse turned from Michigan 59 to the onramp that leads onto US 23 with the 2013 SRT Viper, coming to a full stop for several minutes before launching hard as he entered the highway. As Morse rocketed up the on ramp, he lost control of the 640 horsepower Mopar supercar as he merged onto the northbound 23 – sending the car skidding across the driving lanes and into the grassy median that separates the northbound and southbound lanes of US 23. Unlike some local roads that have either concrete “jersey barriers” or nothing but grass between the two rows of vehicles headed in opposite directions, this section of US 23 has three metal cables running between metal uprights to serve as a safety barrier. When the 2013 Viper driven by Martin Morse got to this cable catch fence, the car was traveling fast enough and sitting low enough that it jammed itself under the top two cables. Unfortunately, the Michigan State Police explained that the lower cable entered the cabin and caught the car up; preventing the Viper from reaching oncoming traffic. The speed at which the Viper hit those cables and velocity with which that thick metal cable entered the cabin likely caused the injuries to Mr. Morse that proved to be fatal. It has not been announced if there had been some mechanical issue with the 2013 SRT Viper that caused Martin Morse to lose control but it should be noted that the local weather (the accident site is only a few minutes from my office) was rainy with cold enough temperatures to possibly cause icy roads. Even with the added stability and traction control systems of the 2013 SRT Viper, the combination of hard acceleration aided by 640 horsepower with wet and possibly icy roads is a recipe for disaster – and that was the exact result. Regardless of the road conditions, it seemed that Mr. Morse was driving the Viper hard on a public road and the result is an example of why that type of driving is prohibited by law. Police do not know why Martin Morse accelerated the way that he did but for anyone who has driven a Viper – or any high performance car – this sounds like something that so many of us have done so many times. Highway onramps provide the perfect excuse to accelerate quickly but there is a time and place for that type of driving and wet, icy roads aren’t the place to do so. There are rumors around the internet that the Launch Control system of the 2013 SRT Viper was activated - which would support that idea that Mr. Morse intentionally launched hard - but with no support from official sources that bit of information could be nothing more than internet nonsense. In any case, this accident should serve as a reminder of what can go wrong when a high performance car is pushed too far on public roads. We believe that this is the first time that a 2013 SRT Viper has been crashed outside of a race course or a closed circuit test such as normal crash testing.